Ancient Stones - Borders - 001 Altar Stone, Stobo, Peebles. 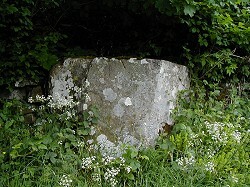 A large stone stands by the roadside opposite the entrance to Altarstone Farm from which the stone takes its name. The stone is rectangular in shape and measures approx. 1.00 x 1.20 x 1.80m. The top surface forms a smooth, flat plane giving suggestion that it may have formed the altar used by druids, perhaps in a temple. However, there does not appear to be any local tradition supporting this nor does the setting suggest so. Why the stone has been named as such may be due to an earlier name for the farm, Arthur's Stane, which was previously in the marshy ground lower down. The local pronunciation was and is A'terstane. A small quarry can be seen in the wood behind the stone and stone quarrying is evident. The Altar Stone is likely to have come from the vicinity of the quarry but whether it is a result of quarrying or is a natural boulder from the original rock outcrop is unclear. From Peebles take the A 72 west towards Glasgow. After 4 miles turn left onto B712 for Moffat and Broughton. Once past Stobo village and before crossing bridge over River Tweed just before Dawyck, turn left up minor road leading to Dreva and Broughton. Altarstone Farm is about 1 mile along this road. There are two options here for parking. One, for those not wishing to walk or for the disabled, is to ask for permission to park in the farm steading at Altarstone Farm, just a few metres from the stone. Alternatively, leave the car in the gravel lay-by at the junction where the B712 joins the minor road to Dreva. Take care walking along the road as it can be busy with traffic at times. The upper surface has some marks, resembling claw imprints, which are said to have been made by a witch who turned into a hare when being hunted by Merlin. The marks are said to have been made by the hare's claws when she raced over the stone. The stone is well weathered and the marks are more likely to be a result of natural forces. But you never know! After a pleasant walk with delightful views across the valley to the west, I found this stone easily and as it was the first stone I had sought out for this web site, it was quite thrilling, despite it's rather plain nature. The stone is almost hidden beneath a tree and is easily missed unless on foot and even then you need to be aware of its existence, as it just looks like any old stone lying on the hillside. Watch out for the farm dog which appears fierce at first but soon backs down when it realises you won't run away. Revisiting the Altar Stone in early March before the Spring growth of vegetation starting obscuring the area, showed the possible source of the stone, a quarry in the woods to the rear. However, examining the quarry and surrounding hill side showed that it is possible that prior to the quarry opening, the hills side had natural rock outcrops and the stone probably originated from there. 006 Standing Stones, Sheriff Muir, Peebles.